It is Bracket time today, something that was once a relatively purposeless handicapping exercise, but now there are now so many various contests and propositions in play on the emerging betting boards that as each year goes by there is more merit in doing the work. This time around it is a particularly precarious path because of the theme that has been discussed here through the NCAA season – there is a dearth of quality at the top. Might Xavier and Kansas be #3 seeds in a different season? Could some of the #2 seeds, Cincinnati and Purdue, be #4’s if judge them against tourneys of the past? In a season of relative mediocrity at the top, what has stood out? 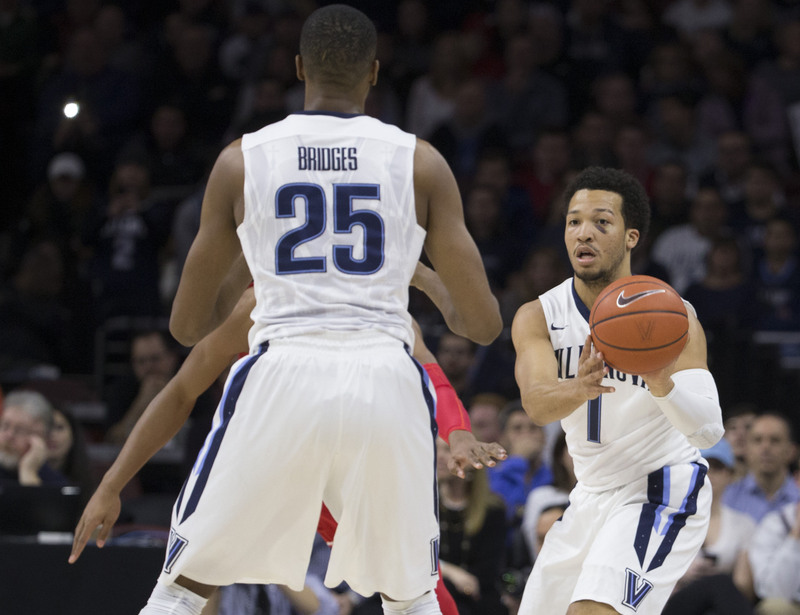 Two particular units that are among the best college basketball has produced over the past decade, the Villanova offense and the Virginia defense. With Villanova it doesn’t take the eyes long to see how the numbers are generated – this is the almost perfect basketball combination of flawless execution by high level talent. Jay Wright’s playbook calls for a lot of motion, and when he has a rotation of players who can both beat defenders off the bounce, and also spot up for 3-point shots, it becomes lethal. At least Jalen Brunson and Mikal Bridges will be playing in the NBA, so what happens when there are good ball handlers, good shooters, and also unselfish players? You get a historic offense. They did get challenged in the Big East, including three losses in the second go-round, because those opponents at least had the opportunity to become familiar with their playbook. That won’t happen in this field, with sets up what could be a championship matchup for the ages of this brilliant offense vs. an equally brilliant defense. Note that most seasons they are a bit under-rated in these categories because unlike overall efficiency, it is not schedule adjusted. The key is that the schedule has remained relatively the same through the cycle, so you can see the change in direction. They were #13 in the nation in Steal%, which is hardly the image one thinks of with the pack line. What do I believe happens when it becomes the great clash of Offense vs. Defense? From the standpoint of being a basketball purist it would be the best such clash since the 2015 Wisconsin Offense/Kentucky Defense squared off in the semi-finals, a bunch of NBA talents going at it in a 71-64 Badgers win. Offense won that day, Wiscy scoring at a 1.22 PPP clip. 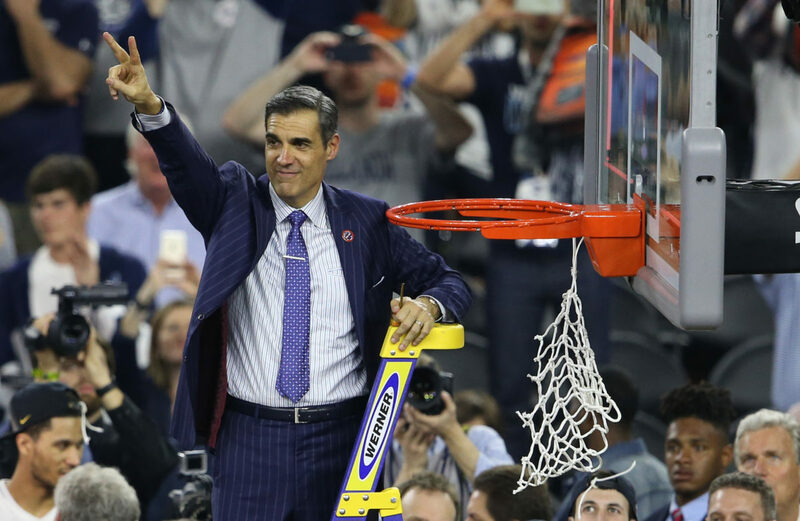 I believe the difference this time would be that Villanova has more individual talent, and sometimes when the playbooks are so even that the X’s and O’s don’t point to the winner, it is the raw ability of someone to step up and make a play that earns the right to cut down the nets. And of course the NBA does not go away because Tourney Time is here, with a board filled with some prime handicapping subplots this evening, perhaps none of them more interesting than what will take place in the Staples Center. The crux is for the Lakers, who are rolling along at 19-9 over their last 28 games, to have a chip on their shoulder from a 125-116 loss to the Nuggets in Denver on Friday. The game flow itself could provide spark – LAL led 110-107 midway through the fourth quarter before getting out-scored 18-6 down the stretch, including a 6-0 over the final 1:25 that had major pointspread impact (Denver closed at -7). 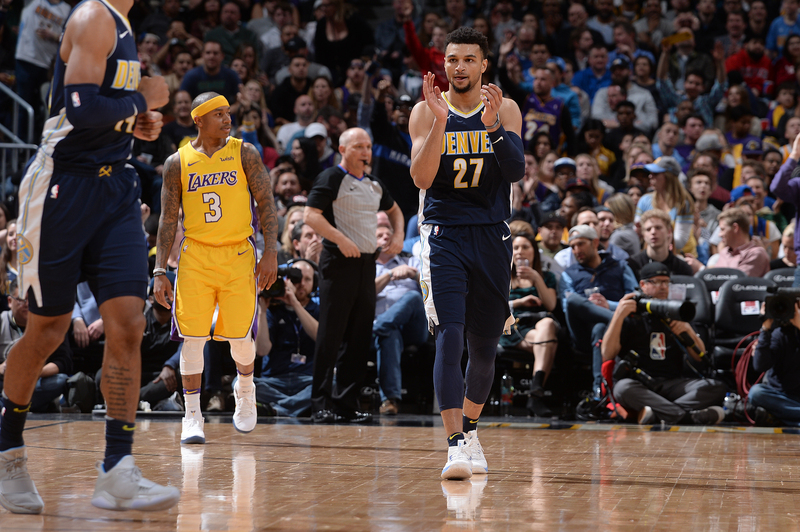 The final four points of that sequence were free throws by Jamal Murray, and it was in the process of closing the game out that for the second time this season Murray got under the skin of the Lakers. This brings the promise of being fun. I don’t see the +3 out there that would trigger a Laker investment, but will be looking for it over the course of the day. For a little follow-up on the difficulties of teams traveling to their first-round NIT sites this evening, note that after Rider became part of the thread discussion yesterday the team was able to get the finances together to charter a flight out of local Trenton-Mercer airport, instead of having to bus over to Newark. That makes it logistically a little easier, though still a daunting challenge, a team that likes to play uptempo (#10 in the nation in pace), perhaps struggling to maintain their energy across the four quarters, especially in a game that tips off at 10 PM on their body clocks. I will be watching that one closely for some In-Running opportunities, and would anticipate Oregon controlling the second half. As the tourney frenzy approaches later this week, proper planning is a major part of the cycle ahead, not just in terms of searching for edges, but in doing the little things that will help you to keep your head clear. That means eating properly, and if you eat good pizza, that is sure damn proper. By good pizza I mean skipping anything average (and at all times please skip what is below that). There isn’t anything wrong with average when the time is right; sometimes a quick fix is needed, and some average places bring bang for your buck. But Tourney time demands a higher degree of alertness, and that is one of the best ways to differentiate between what is average and what rises above it – when a bite of pizza makes you think about it, and think about it in a good way, you have elevated to the right seed in the culinary brackets. That is what pizza was historically created to be, something that can reach wonderful heights when the proper effort and execution are there, and while Las Vegas wasn’t anything special on the pizza scene not too long ago there are some real players now. In alphabetical order, because the power ratings are too difficult to sort, away from the Strip one should have no hesitation to try Due Forni, any of the Metro locations, the Naked City outposts, Pizza Rock, Pizzeria Monzu and either Settebello shop. There are also several Italian restaurants that are worthy, like Ferraro’s and Esther’s. There has been another new player added to the scene, Good Pie, and for those that live in our fair city, or are coming to town at tournament time, they can be added to your list. This is the first attempt to create a prototypical Brooklyn-style shop, and the back story of Vincent Rotolo tells the tale. The integrity is first-rate, so on bracket Monday, when the afternoon was going to be spent polishing so many details of the madness ahead, it was a prime opportunity to bring a pie home, set it on the counter, and nibble away over the course of the day (then the fridge for Tuesday, and likely two pieces left for Wednesday breakfast). This time the day called for “It’s All Good”, grandma-style: tomato sauce, fresh mozzarella, Italian sausage, thinly shaved red onion, Mike’s hot honey, chili flakes, grana padano cheese, lemon zest and basil. This is what I refer to as something that makes you think when you take each bite, and not just consuming mindless calories. There are a lot of flavor dimensions going on, skillfully kept in balance and supported by a crust that sets the stage – thin but with character, the combination of crunch and chew that is not easy to pull off unless you really know what you are doing. Rotolo does (you can go “Detroit Style” if you want a thicker dough). To save time on a busy week the best bet is to order on-line or call-ahead. There are a couple of stools in the small shop, as well as the outdoor seating at Pawn Plaza when the weather allows (the tables are in the shade, which will be fine in the summer heat but a bit cool for now), if you want to eat there. But this week you are not going to want to do that. You are going to need proper sustenance to support yourself through the Tournament cycle ahead; you might as well make each bit a good one. 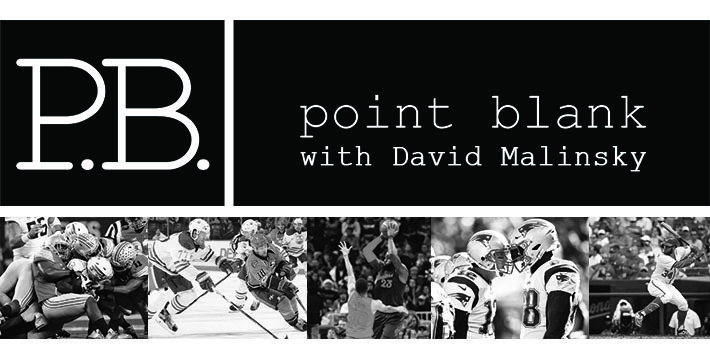 If you want to know when PB is ready to go each day, as well as following along for some of the most important Sports Betting news as it unfolds, make @Vegaspointblank a part of your routine. Last edited by Point Blank; 03-13-18 at 04:01 PM. Dave - That pizza would pair well with the 2013 Red Mountain Tempranillo that we released this Sunday. Dare I say it is better than the 2012. It would - there is a sophistication in play that absolutely calls for something of quality to help wash it down - the flavor profiles are ideal for that Tempranillo, and also some citrus-forward IPA's, so many of which are being produced these days in New England and out here on the West Coast. Vincent Rotolo is going to be a player out here. My bad - I have edited to make it a little more clear - the top shows the two Michigan schools earning their way, and I have added a Final Four near the end of that section. I like the Red Raiders a lot, and wish they were in one of the other regions, but they do have a shot against the Wildcats - they have enough depth and savvy to compete on defense, and can also win the battle of the boards, the one aspect of the game in which Villanova is only average. I also have a West Virginia ticket in a similar price range, which was a misread on my point in terms of the timing, but opens up a fascinating question - while the Mountaineers seemingly disappointed because their presses weren't as effective as usual, was that also a result of being in a Big 12 that had terrific guard play this season, and teams that knew how to cope with the Huggins defense. Might it now be an entirely different story as WVU takes on teams unfamiliar with those presses, and lacking the quality of guards the Big 12 had? I don't see any positioning available to work off of the Futures ticket because I expect them to win their first two games, before running into Villanova in the Sweet 16, the Wildcats one team that won't be bothered at all by pressure defense. That doesn't leave much opportunity to maneuver, unless Villy is low enough on the Money Line for that matchup. Texas A&M is also similar in that I don't want Providence in the opening round, the prospect of the Friars having heavy legs after three straight OTs in the Big East tournament, two of them against #1 seeds. I don't see value in bucking WVU or A&M in their opening games, and the rule of thumb is that we never want to make a bad bet to play off of previous positions, since any wager that doesn't bring a positive expectation lowers the long-term portfolio a bit. Realizing I like mostly favorites, are there any unique handicapping issues to consider before laying it with heavy favorites unique to the tournament? Thoughts on the above plays? Thanks. Hard to see Kansas losing a regional final in Omaha. One of the major questions with the two Michigan schools will be something a lot of us will be tracking closely - is it more Rest or Rust with the Big 10 schools, having had that extra time off? I believe for those two schools it is likely more of the former, because Beilein/Izzo have been down this road so many times, and are better-suited to handling the time off than less experienced coaches. Hence what you may get from them are teams hungry to get out and play well, re-establishing their full playing rhythms, as opposed to big first round favorites who are often a bit weary off of their league tournaments, and using a game as big chalk to be a buffer before they have to step back up in class again. SF Austin might be a difficult team to lay points to - they are tenacious on defense, and more than held their own in those early season road challenges at Mississippi State (L 80-85), LSU (W 83-82) and Missouri (L 81-82). I don't think the Lumberjacks have the talent to challenge T Tech for the outright win, but they like to press (#1 in the nation in TO% forced, though that is without adjusting for schedule), and that makes them dangerous through the back door. Is North Kentucky +8 too good to be true. Louisville players are forced to play despite voting not to accept the NIT bid. And one would think the Norsemen would be excited to play a regional power team. No travel issues. Am I missing something here? When does Baylor go in to pocket? I guess the market consensus opener was around 16, now down to 13. I understand Baylor is disappointed being a bubble team and not getting in, and their coach joked about it. However, I think this is a match up mismatch. Wagner Forwards are 6'3/6'4 and centers are 6'8. Baylor should be able to dominate down low whether they are motivated or not. They have a lot of guys (4 seniors) they want to send out with a win (or at least not a loss on their home court). Additionally, Wagner's only game vs Kenpom top 200 was a 44 pt loss to Mizzou. They also have to be extremely disappointed losing the tourney championship game AGAIN, and not making the Dance. Thanks! I doubt 1500 will show up to watch USC even if they had a buffet that was free to the public. That crowd may only get to 1500 if the players, coaches, managers, officials and cheerleaders are counted. It is a long trip for Asheville, but here is an underdog that has nothing to lose, and should at least go out there and try to scrap around. That one has become complicated. As noted in the Monday edition, not only are the Louisville students on Spring Break, but also two of the NK key cogs are from Louisville, and should bring plenty of spark. But has there been an emotional pendulum for the Louisville players that may now begin swing the other way? "When you're emotional, you're still sad about all the NCAA Tournament stuff, and you make assumptions — you make decisions — that you don't know what the consequences are. But when we went to sleep and we woke up (Monday) morning and we met again as a team, we started thinking more broadly of the consequences of our actions and that it's not just going to affect us right now — it's going to affect the whole city and the whole program. We realized playing and participating and actually putting in the effort to do what we came here to do was the best decision." Have things possibly turned around a bit for the Cardinals in the last 24 hours? That isn't easy to answer. I bit off some +9 yesterday when it first hit the board and will likely ride it out, although there was a temptation to lay back a little -7 when I read through the Mahmoud quotes this morning. Could it be possible that the vote not to play was the cathartic moment those players needed, and having made that statement might take a deep breath and play good basketball? It will be an interesting case study. Last edited by Point Blank; 03-13-18 at 12:27 PM. #550 Baylor goes into pocket now, -13 the trigger. Wagner charted as the smallest team in the nation this season, #351 in Effective Height, while Baylor was #13, and it isn't just that the Bears are tall, they are also athletic. Wagner struggled to score near the basket against weak competition (#270 in 2-point%), and now will find nothing easy near the rim, while also having to hit 3-point shots from further out. Note that there was one other Wagner game against a KenPom Top 200, a short trip to play Seton Hall, where they fell down big early and lost by 21. Last edited by Point Blank; 03-13-18 at 12:33 PM. Is it safe to assume your bracket reflects strictly what you think will happen in each game, and if so, are there any teams you might look at differently in pools of ~20-40 brackets? With pools much bigger than that it's arguably too random, but settling into a pool the right size can present the opportunity to go out on a limb or two, without straying too far from the chalk, and still having a legitimate shot to win. As with other forms of betting, house rules are an important factor to consider. Most pools simply double the points each round, placing a disproportionate emphasis on hitting the champion/title game matchup/Final Four. But my favorite pool every year, perhaps because a fair amount entries seem to ignore the uncommon settings, escalates the value of a win by one point per round (Round of 64 games = 1 point each, championship game = 6 points), and then adds the seed number of the winning team. So correctly picking a 10 seed to advance to the Sweet 16, for example, can be worth 23 points (1 point for round of 64 win + 10 points for seed number, plus 2 points for round of 32 win + 10 points for seed number), more than overshadowing an incorrect champion pick (7 points if it's a 1 seed that wins). For as over-hyped as early-round upsets can be, this particular pool can make them lucrative, especially when understanding that a 10 seed knocking off a 7 isn't always an "upset" when looking at the odds instead of the seeding. There is a lot going into pocket, but as noted often here keeping much of it quiet is also a professional priority. The door is open to answer any questions on betting topics, and to sort through game opinions that anyone has, since breaking games down in detail helps everyone to see the various methods involved. But outside of what is laid out in the lead topic each day, which covers a fair amount of ground, voluntarily offering up what is scribbled on the cocktail napkin on the desk would be putting too much information out there, to the point of it becoming counter-productive (there are a fair number of guys working behind the counter that post in these threads). I am neutral on SF Austin/Texas Tech at the price point, respecting the ability of the underdog to defend, but not sure they can find enough easy baskets, which they were accustomed to getting through that defensive pressure during conference play (pressure that will be far less effective against Tech). That bracket should be considered "most likely outcomes", based on matchups and power ratings. I have a half dozen or so different pools that I will be in, including the one you list as your favorite, which I believe is the best of all. That one got me interested in teams like Butler, Texas and Missouri, the low seeds that might be able to make it to the Sweet 16 base don the draw, and of course having the two Michigan schools making it to San Antonio also makes them valuable in just about any kind of pool. Michigan State over Duke? Hmmmmm. Certainly State’s future NBA stars have more experience in this tournament as they do with their coach than does Duke’s NBA players, Allen notwithstanding. Izzo is a great coach. Duke sports 7 of the top 100 ball players, based upon the site you directed is to earlier in the season. I see Duke getting passed that game and defeating Nova and The Wahoos, knowing the play book of Virginia well. I argue the greatest coach on the sideline in K, and Duke is cresting at the right time of the year. If Duke does get to the final 4, how far do you rate them behind Villanova? This year's team is way out of character, and in particular study the end-game charts of their losses to see how many times they turned the ball over under game pressure (they turned it over on 25% of all possessions vs. North Carolina in the ACC semi-finals, despite the Tar Heels not being anything special at taking the ball away). That is where I can see them struggling beyond the first weekend of the tournament, when they will be up against good defenses, which they have not shown the ability to tactically solve yet. I would have Villanova -2.5 vs. Duke on a neutral right now. Last edited by Point Blank; 03-13-18 at 02:58 PM. Dave - any thoughts on backing UCLA -2.5 since the Bonnies will be going at it without Stockard with an already shallow bench? “Hopefully we can have him play. It will be a game-time decision, but hopefully he’ll be out there and he’ll be 100 percent and he can help us. We play much better when he’s out there and he’s playing healthy." There is a matchup headache for the Bruins here - they do not guard the perimeter well, an ugly #340 in TO% forced, and #170 in 3-point% allowed. St. Bonny does a terrific job of both handling the ball (#41 in TO%) and knocking down shots with Adams/Mobley (#19 in the nation in 3-pt% a a team), so that likely keeps them in the game. But Stockard is a difference maker in this rotation, especially given the size the Bonnies give away around the basket (he scraps hard on the boards). It keeps me neutral for now. Last edited by Point Blank; 03-13-18 at 03:58 PM. A few of us were taken by surprise that they are calling him out for the entire tournament, but the break is going to require surgery, and they don't have the surgery scheduled until next Monday. Hunter only averaged 19.9 mpg (48 minutes in the 3 ACC tourney wins) but was an impact player, the ACC 6th Man of the Year, so there is a void left. I had originally heard that there was a chance for him to come back for the Sweet 16, perhaps playing with a soft cast, because the injury was to his left wrist, but it looks like the nature of the break makes it too difficult for him to even attempt that. Did you ever come close to leaving this pursuit? I find it so difficult to make any long term profitability. There seems to be only a way to lose severely and a slight opening to make small gains. I know the sports betting markets are sharper now compared to previous decades. But I was just in Vegas and watched somebody play 1/2 NL poker and make 500 dollars off two brutal players. Even if you don't leave the game it does make you take pause. One of the serious issues on that front is "What do you replace it with?" There is an intellectual challenge that is so difficult to find from other pursuits, and what this endeavor builds inside of a person, in terms of work ethic, patience, discipline, broadening the imagination, and so many valuable traits, is also not easy found elsewhere. It isn't that you need them in order to thrive, it is that you need them in order to merely survive, and over time that builds a unique foundation inside of a person. There is a non-sports project I have become more deeply involved with through the years, which explains the Friday disappearances between the Super Bowl and the NCAA tournament, and will also include going completely off the grid most Saturdays once the tourneys are over. It is one of the few things that matches some of the challenges of the sports betting boards, but I am not sure that I would ever completely walk away from the sports world - I believe one of the keys to being effective in the outside project are the new layers of various disciplines that sports betting keeps bringing into play, which enhances the ability to do research across other realms. So for now it isn't just building the financial portfolio out of sports, but it is also what these daily processes do in terms of enhancing the ability to take on other challenges. Apologies for a long-winded answer, but there probably isn't any way to shorten it. To update on that one, Stockard will be dressed tonight and it looks like he will at least attempt to play. How effective he can be will certainly be a matter of interest for In-Running on that one. Hi Dave. 8 was the perfect number for your lville/nken play. I grabbed a late -7. Well done sir and thank you once again. Appreciate the completed bracket as well. Will make life a lot easier tomorrow without much time for in depth research. Any tweaks for late Uva injury? Also when I last visited we grabbed a quick slice and a pbr for 3 bucks from Evil Pie just off Fremont on our way to The Cortez. No frills but the pizza was out fast and hot and the beer was cold. Reminded me of Long Island pizzerias from my childhood. Thank you again Dave. Appreciate all of your help.